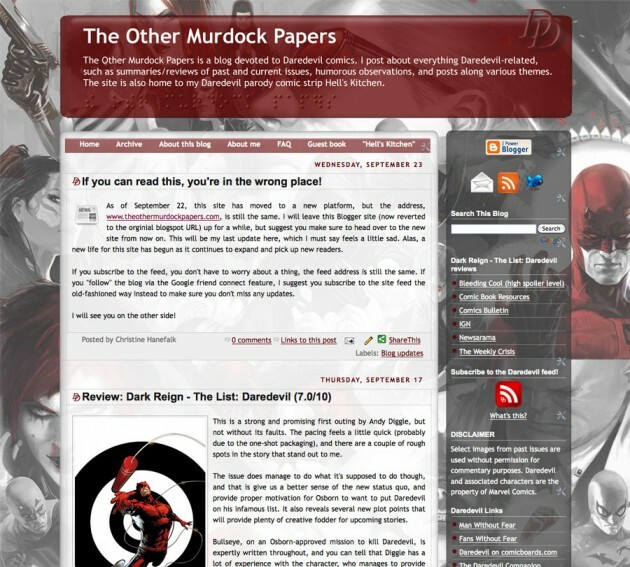 The Other Murdock Papers - 500 Daredevil posts later! Almost four years ago, in December of 2007, this site made an anonymous debut. I didn’t announce it anywhere, didn’t link to it, just put the site up – then hosted on Blogger – and wrote three posts. I made a conscious decision to wait to do anything else until I knew I could commit to a regular schedule. In March of 2008, I decided that the time had come and since then post has been added to post to finally reach the nice round number of 500. Some months, reaching or even exceeding my own target of 8-12 posts has been easy, at other times, I’ve fallen short of my goal. However, what has kept me going relatively strong this entire time has been all the joy and inspiration I get from the Daredevil comic itself, as well as the community of fellow fans that keep coming back to this site, commenting or in other ways engaging with the content. I cannot thank you enough! I had some pretty lofty goals for post number five hundred, some of which I’ll get to later in the fall (such as setting up a bona fide resource section), but the time got away from me and I wanted to get this milestone post up before going to my very first New York Comic Con in less than eight hours. One thing I did manage to arrange however, was to reach out to a new recruit. I decided that the time had come to try to branch out a bit, and get more than my own views represented here, so I asked frequent commenter – and former guest post writer – Aaron K whether he’d be interested in coming on board as a TOMP contributor (now doesn’t that sound fancy?) on a one post per month basis, at least to start. Now, this new addition is not reason for me to slack off, rather it’s an opportunity to bring in some new blood. Aaron’s first post will be up next week! I know many of you have been TOMP readers for a long time, but there are some who may be new to this site. Regardless of which category you belong to, I thought it might be fun to show you two previous incarnations of this site. The first one is from the Blogger days when, for the first few months, this site could be found at theothermurdockpapers.blogspot.com. As you might guess, I like to change the look of the site occasionally (without losing too much in the process in terms of branding), and I’ll probably change it again some time in the future, as more content is added. For many of you, this won’t be news (and the info is already on the site), but I’d like to take the opportunity to once again remind new and old readers alike of the ways you can keep up with new posts. I always post information about new posts on my Twitter account and the TOMP Facebook page. You can also subscribe to posts via email or by using the RSS feed. You can also follow new comments site-wide, by subscribing to the main comment RSS feed. The blog has indeed come a long way (it’s neat to see that early blogger version), and it has only gotten better. Congratulations on 500 posts, and have fun in New York! New contributor, that’s awesome. 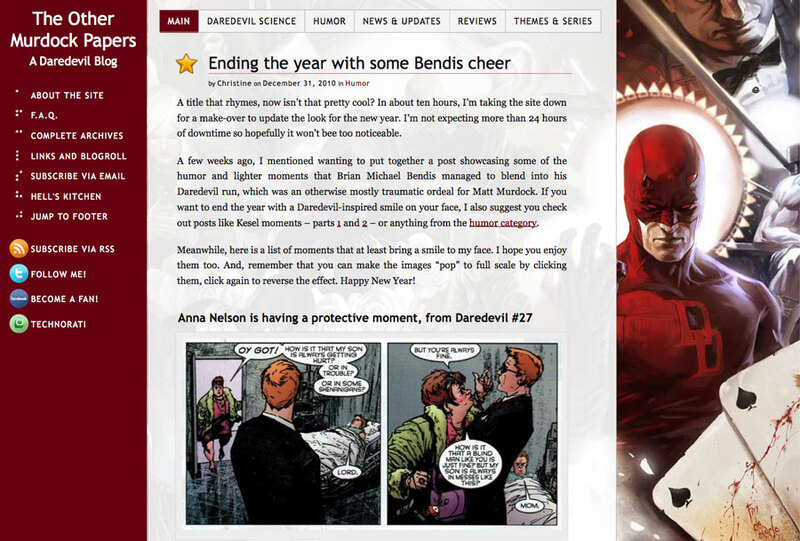 This site has always been fantastic, a nice place to share more Daredevil love, and I look forward to 500 more posts. You have also inspired me to start a blog on either Daredevil or Batman myself since both characters have recently been renumbered. I am most likely leaning towards The Dark Knight since what you have with “The Other Murdock Papers” is the only blog I think is needed in regard to our favorite blind lawyer. However, I will do so as a novice reader to comics since that is who I am. The last time I read a comic it was my brother’s copy of The Infinity Gauntlet. And that, I believe, must be at least 2 decades or more now. Anyway, I love your site. Congratulations, Chris — 500 posts is quite the achievement! Hope you have a great time at NYCC! Congratulations, Christine. I always appreciate your hard work on this site and your encouragement to me over the years. Christine, As a ravenous DD fan I was thrilled to find your blog a couple years ago. In that time it’s been a joy to read your musings on my most favorite character and interact with a community that is just as passionate about the man without fear as I am. Keep up the good work …we’ll be here. Congrats. Love your site. Wish I’d found it long before I did. Best place for Daredevil fans. I can’t wait to see what kind of crazy and interesting topics you manage to come up with for the NEXT 500 posts! Congratulations! CONGRADULATIONS! THANK YOU FOR ALL THE TIME YOU’VE INVESTED! Big congrats on reaching a major milestone. You’ve created a great site for your fellow obsessed DD fans. Appreciate all your hard work and devotion.